The bow section, we are beginning to get an impression of just how big this boat is. Charlie of course will have more of a feeling for that than I as he is the one with the blisters on his hands from fitting all that planking. 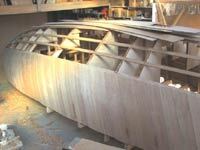 Sometime in the last few days the anonymous mass of stringers and frames out in my workshop turned into a boat! 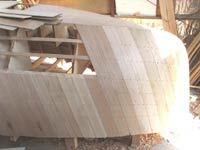 I stood in the workshop doorway today and looked across at what just a few days ago looked like a skeleton , a framework where one had to look hard to pick out the shape of the boat, and a structure where the inside could not be “felt” because the boundary between inside and out was not visually apparent. Today though, there is some of the bottom, and all of the topsides plus the forefoot area up around the stem all “there”. I crawled under the gunwale and into the main cabin, even upside down and with the chine panels yet to be fitted that cabin is beginning to feel like the spacious little haven I drew when roughing out the plans proposal. We will have to move all the machinery soon so we can get you a good photo from a little distance, but even from this close up the view from alongside the bow aft show that the little boat is a very curvy lady, the way she is planked up with curves in her topsides makes her not only a great deal stronger than a flat panel but much nicer looking that a slab sided sheet ply boat of these proportions would have been. Soon the bottom will be completely planked up , one layer at least. Then the chine panel gets planked up and with all the practice he is getting Charlie is making much faster progress so that wont take long, then the boats shape will truly be visible. As I write there is the sound of progress, first the Japanese pull saw cutting off the plank to length, the bandsaw and hand plane shaping the piece then the jointer putting the little angle on the edge. Soon I’ll hear the cordless drill dry fitting the plank, and when I go out to the shop later this afternoon he will be glueing half a dozen planks on. At a slight angle, and about 200mm wide that’s another 1200mm of the panel all covered. Same again tomorrow, and so on. I’m away this weekend, it’s the second annual Plimmerton Classic Boat Regatta about 6 hours drive away. I’m the guest speaker at Saturday nights dinner (what some people will do for a free meal eh?) and I’m looking forward to seeing what Resolution looks like when I get back on Monday. Four days makes a very visible difference.